It’s taken me a long time to accept the fact that I don’t really like desks. At least not small ones that are designated for tasks that don’t involve spreading out—I need space. Because of my aversion to small desks, I’ve spent an awful lot of time over the last few years camped out on the sofa with my laptop doing freelance work at 2AM, and honestly, my body isn’t happy about it. I need to be sitting at a table in order to work (and sit) properly for any length of time, and that table needs to be spacious. That said, you know what’s not spacious? The new apartment. The entire thing corner to corner is about 450sf, and that’s including a bedroom the approximate length and width of a Sucrets tin. The kitchen and living space are one open room, though, which does open up the possibility of having a decently-sized, multi-purpose table in the room—for working, eating, cooking, sewing and whatever else requires a flat surface. I’ve been keeping this table idea in the back of my mind for a while now. 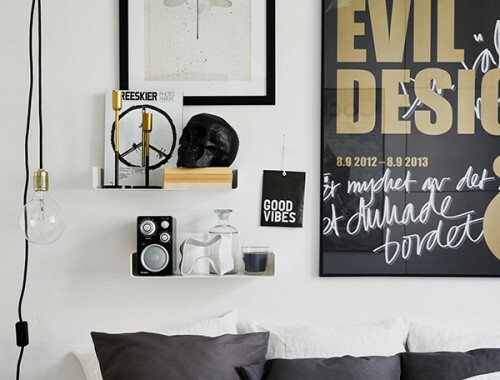 It comes from IKEA’s Livet Hemma (Life At Home) blog, which, in case you’ve never seen it, is a trove of photos and project ideas that involve stuff from IKEA used in very un-showroom-like ways. 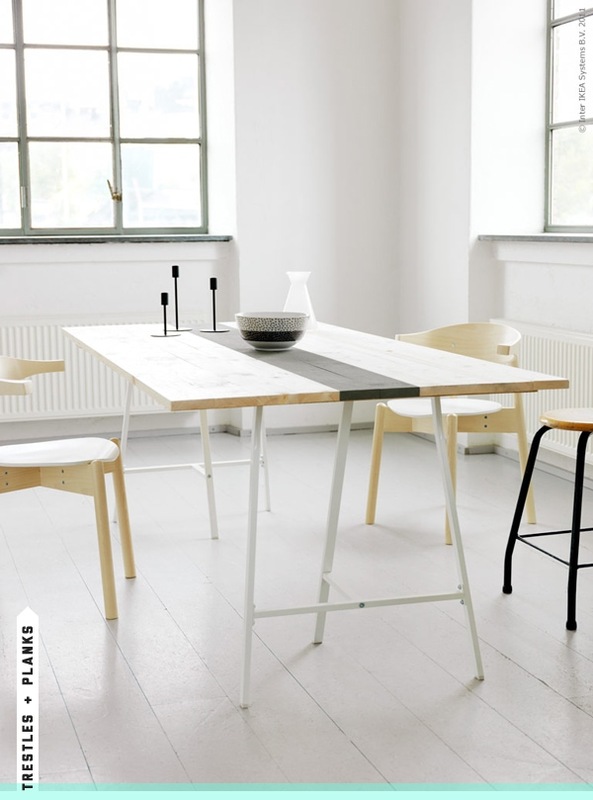 To make this table, they just used a pair of inexpensive VIKA LERBERG trestles and some simple spruce planks for the top. I love the “runner” they created by painting the center boards! The great thing about the LERBERG trestles is that they’re less than 16″ deep, so it’s possible to make a shallower table with them to suit the amount space you have—and, of course, you can cut your planks to whatever length you’d like. I definitely don’t have enough space for a setup like this, but I do like how much storage the base components provide. The top is supported by four VIKA ALEX units from IKEA—two with doors, and two with drawers. The depth is at least 22″, so it’s probably not an option to use even one of these drawer units in the new place (did I mention it’s tiny? ), but I can still dream. Speaking of dreaming, take a look at the entire house that this room is at part of. It’s one of those rare places I could move into fully furnished and not want to change anything. OK, now we’re really getting somewhere. 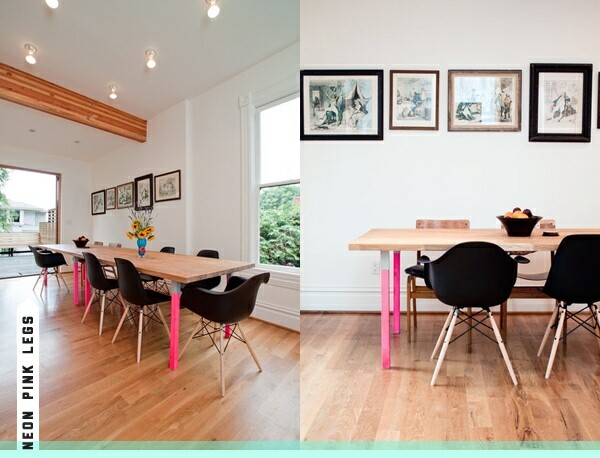 The second I saw this Victorian house tour, I knew I’d be needing some neon pink table legs in my future. I love the way this looks. Once again, the support for this table comes from IKEA—four VIKA FURUSUND legs—and the top appears to just be a simple piece of butcherblock countertop (NUMERAR, perhaps?). The legs are solid, unfinished pine, making them perfectly suited for painting. They’re really just asking to be neon pink, right? I keep picturing a smaller-scale version of this table in the apartment, surrounded by the dowel-leg side shells currently in the “old” apartment kitchen (I have two more stashed in the basement at the house), and it just seems perfect. Enough space to have Daniel and Max over for dinner, even! Yeah, this is my own big fat work table! It’s in the room at the house that Evan is now using as a studio, and it’s awesome. The top comes from my father’s huge old drafting table (the original legs are in storage, don’t worry! ), and the legs are—you guessed it—VIKA MOLIDEN trestles from IKEA. You can see some more detailed photos of the top and the cool drawer handles in this old post. It’s a special table, this one. More than any aspect of the new apartment (yes, even more than the roof deck), the possibility of having a big space to spread out and work is exciting me the most. I’m sure I’ll still spend plenty of time planted on the sofa with my laptop, yes, but for the long hauls, it’s going to be great to sit like a normal person. A normal person with dogs on my lap, of course. p.s. 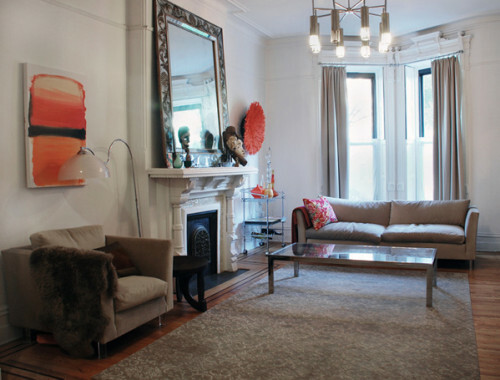 Please vote for Manhattan Nest in the 2012 Homies Awards over at Apartment Therapy. You need to log in to vote, but it’s worth it. Daniel truly deserves to win this. You definitely need a table with hot pink legs, go for it. I love that one with the VIKA ALEX supports – such a good looking system (we have some of the drawers already) and I REALLY love the pink legs on the other… so doable. I like having a big space for my junk to spread out… our computer is on the dining table – the one we almost never eat at, as it’s almost always covered with ALL MY JUNK! I need the room. Tiny desks just don’t work for me at all. When we (finally) do the basement, it will require something kinda massive, I reckon. Ahhh, I’ve had a can of hot pink spray paint just waiting for the god forsaken snow to stop, but only for a little beige work stool that needs some pink legs. Remember to go vertical if you need more storage. Experience from the ol’ Container Store days. 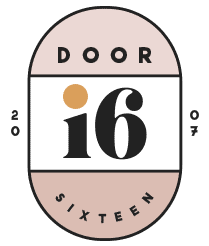 Love the post and your eye for design. My best friend is writing a book on his sofa, balancing a macbook, and I have been tsktsk-ing him forever about it. I hope this inspires him a bit. How could anyone read Manhattan Nest and NOT vote for Daniel? His creativity astounds me, and his sense of humour makes me laugh. Loud. Do Sucrets even still come in tins? I fear my reference may have been lost sometime around 1982, haha!! I was about to mention that I have a tin in my medicine cabinet. I chuckled, too, at the Sucrets tin reference. I hadn’t thought of them in years! And then right after I saw this post I was at my fave junk/furniture store and saw a Sucrets tin! Too funny. 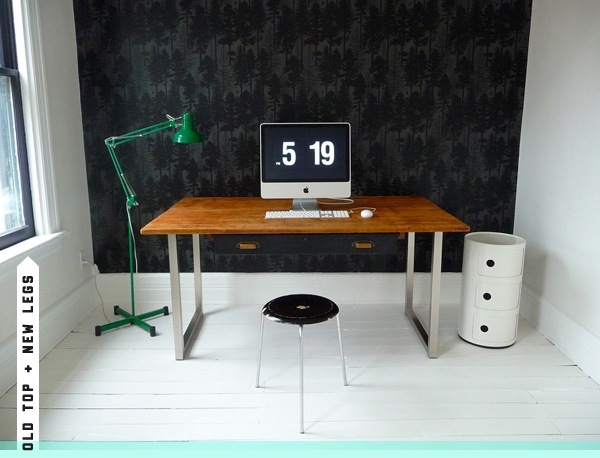 You didn’t even need to link to the old post (not for me, anyway) because that is the first post of yours I ever read, and I remember it to this day because (1) I loved it and (2) I loved your desk and its history as much as the post. I’m excited to see what you do with the new place! 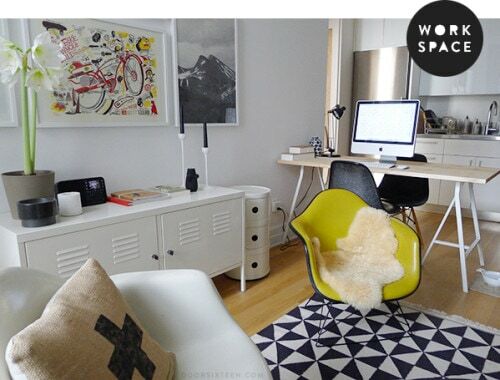 love the hot pink legs and those eames chairs! perfect. I absolutely hear ya! I’ve had to live with one too many itty bitty little desks, so I found myself a nice 5’x3′ dining table and that is my desk now. It’s awesome. I love having so much space to spread out! Sure, I don’t have room for an actual dining table any more, but I’d rather eat on my sofa and have a giant work space I love, than an itty bitty desk. Three cheers for huge work surfaces! Ah! Thank you, thank you! This post has inspired me to make the leap with my Ikea VIKA LILLEBY trestles. I have them in unfinished pine (I think) and with a white top. I have been wanting to paint them, but seeing those hot pink legs gave me the kick in the pants that I needed! Woot! Oh my, I love that first table! I wonder if it would be easy to screw and unscrew the legs? We only have one area to accommodate dining and it currently houses a Saarinen Tulip Table (scored for $50!) but that only seats 5 comfortably. I refuse to relinquish it to the basement in favor of a larger table because I love it so but, it does pose a problem when we have more than 3 guests for dinner. I could just swap out the tables the few times a year it’s necessary and then keep the dismantled backup table stored away. I’ve been looking for a cheap and stylish solution to my dining situation for awhile now and this may be the answer! You’re always a wealth of inspiration Anna! Thanks for the ideas! Also, add me to the list of people who can’t wait to see what’s in store for your new apartment! Sherry, the trestles would be easy to detach from the top (though after several unscrewings, the wood might start to lose its “grip” on the screws), but the trestles themselves do require some effort to disassemble. If you have the room to store the assembled trestles, though, it would work just fine. You might even be able to just rest the top on the trestles without using any screws. Have you considered a folding table? Not that there aren’t options other than IKEA, but they do make a very nice, very simple wood one that can be painted or finished however you like. I do have room to store the trestles, but I hear what you mean about the wear and tear of the screw holes. Most folding tables I see around here are cheap, poorly made, and ugly. The one from IKEA is nice but it would be an issue for me to bring it home since our cars are tiny and the closest IKEA is 45 minutes across the Canadian border. Not that I don’t go there all the time but we usually grab smaller things, like a sliding rail for our besta TV stand that cost $25 more than it would have in the US (god I am still sore about that.) I could bring home trestles easily though, or you know keep hoping against all hope that they open an IKEA in Buffalo. i definitely know what you are talking about! i had the same issue when we moved into our new home. after looking around for so long without any luck, my dad ended up building our 7 foot desk from lumber that we went to go pick together at the lumber yard. it’s definitely made a world of difference as i have a bad back also. 🙂 can’t wait to see what you end up choosing for your space! Thanks so much for this – I need a kick of inspiration for my corner of the house where I spend most of my time. …and for the three degrees of separation of the intertubes. I began following you LIKE forever ago…and about a year ago Kathryn Tyler after seeing her on Grand Designs – life can be just like that I suppose, but the triangularity of it made my morning. Ohh – I hear you! Tables + space = MUST! This coming May I’ve been living in my 460 sqf appt. for 25 years. (Yes it is doable. But you gotta love it *s*) I’ve finally, finally found solutions how to arrange and incorporate my sewingarea and still maintain some kind of decent livingroom: 3 tabletops (IKEA), 2 of them with legs on wheel – this way I can make/have a super-size sewingtable for quilting, 2 sizes of diningtables depending on no. of guests or a long table from one wall to the other(like your 2nd photo), where I can sew smaller items, use my laptop and printer and move my flatscreen tv over to watch when sewing. Thank you for this! I was getting so bored with my VIKA FURUSUND desk… I think about a cheaper solution now, instead of looking for a new desk. And this will fit my purse better for sure! Talk about perfect timing!! I was struggling with getting our home-office to work for us. Currently we have the Vika Amon/Vika Curry tables (from a loooong looong time ago) and that’s what we used for the dual desks. To say it gets cluttered, is an understatement. Thanks for the the amazing post! Hmm, Anna, I’m living on about 400 sqf and I have both a decent kitchen table as well as a proper desk, maybe not the size you want/need but I can still spread out more than just a couple of papers. I don’t really need separate tables. For me, one big surface for everything makes more sense! Anna, I was just wondering since your decorating style is way more minimalistic than mine and 50 more sqf at your disposal should according to my calculations be sufficient for a gorgeous table!? Especially since you don’t want two separate tables. Anyway, I’m very curious to see what you end up choosing, so have fun and hopefully you’ll end up with a fantastic table that is flexible the way you need it to be. Totally with you on desks, the bigger the better! So obviously you already have your setup done, but for those looking to do something like this: I was actually able to score 2 awesome yellow sawhorses and a plain wooden door from Home Depot for $80 total (put some subtle sealant on the wood though). Because the sawhorses are made for cuttin’ and sawin’ and all sorts of butch things, they’re super-stable. Hope that helps someone! Love this post! Especially that Corkellis House — it’s SO amazing! Speaking of their use of the VIKA ALEX units, any chance you recognize their bedroom dresser? It looks so much like the Ikea ALEX line but nothing I’ve seen before. I wonder if Ikea used to make a deep version of the EKBY ALEX. Ever since I saw the Snow Dresser from Asplund and it’s ridiculous pricetag, I’ve thought about trying to make one using ALEX components, but it would be a pretty shallow dresser. shallow desks are the worst! i use a big ikea table for mine. i might have to spray paint the legs hot pink after seeing this. ideally i’d have two ikea tables back to back in the middle of the room and then a long shallow desk for our macs along a wall, but i’m dreaming when it comes to space. Anna, I’m curious about the drawers under the desk in Evan’s studio. Where did you get them? Are they well-functioning drawers? 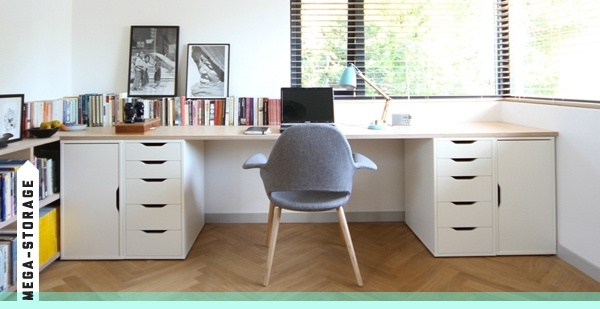 I’d love to use a table as a desk but my husband wants drawers, and this seems like a perfect solution. Oooh, I love the hot pink painted legs! I think I might be way too excited that I picked out the same legs (MOLIDEN) for my husband’s desk a few years ago. I LOVE the pink legs on that table! I’ve been toying with painting the window frame in my work space hot pink. Oh, that house… I almost wept with envy and joy when I watched that house being built and furnished on Grand Designs! It is perfection. The white brick and wood exterior, the furniture, the art, sigh. Thanks so much for posting the link because i have been searching for pictures of the staircase. The grand designs website doesn’t have a decent one. You must watch it Anna, if you haven’t already. I don’t know what Grand Designs is. A TV show? It can’t be viewed in the US, sadly, but thank you anyway!! Love your site! This is slightly off topic, but as a fellow lover of old homes, I thought you’d enjoy this site: http://oldhousedreams.com/. It’s a treasure trove of homes for sale around the nation– some need a lot of love, some fully restored, all fascinating! a really like the big-fat-work table of the first picture…. and everything round it 🙂 Beautiful picture…. I should go for it! So where are the pics of the new Brooklyn apartment? Hmm? Haha, it’s only been three days! Oh I love the first one !!! I agree. There’s nothing better than a huge work surface. I’ve got a huge drafting table that I love. Anytime I have to work elsewhere, its just not right. I think the Vika Lerbergs are really 23 5/8″ deep if I’m interpreting the ‘Ikeanese’ correctly. The 15 3/8″ measurement is side-to-side. I got all excited there for a second because I thought they might work for my narrow workspace. Cussot, 15 3/8″ is the depth measurement of the top of the trestle. wow….great stuff. Who doesn’t love a nice big table to stretch out on. Most of those tables are so easy to make too. Might just have to get in the shop soon! i’ve been looking for a lamp like the green one that y’all have… where can I get one? Love your style! Keep up the great work. Question: I’ve seen that clock app on monitors everywhere, but I can’t find where to download it. What’s it called? I love your Ikea combinations. You can find another interesting DIY idea using Vika Lerberg at my blog and many other ideas!